grounded theory methods for qualitative research. couch, staring off toward the television” (Fieldnotes, 1992: p.
into laughter” (Fieldnotes, 1992: p. 26). 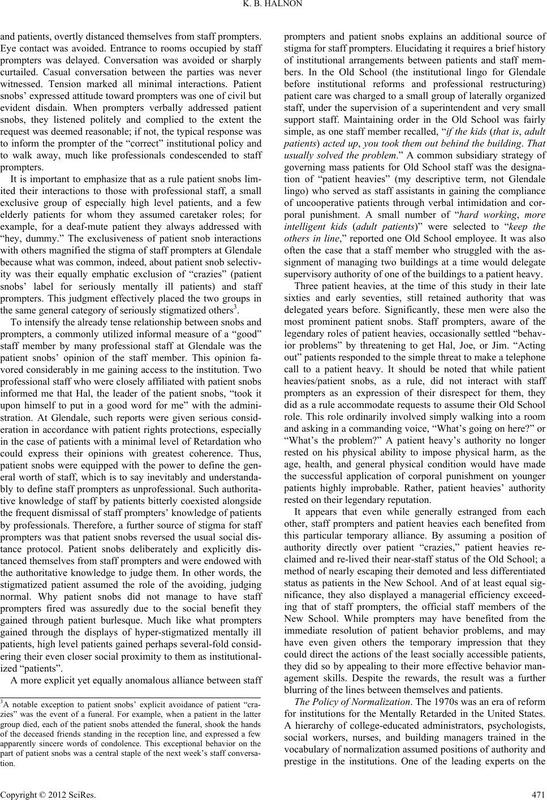 tion dedicated to normalizing patients. als at Glendale who opened and entrusted their institutional world to me. a form direct staff member self-defense in a total institution. their own shame and humiliation” (Ibid, 35). Martin (1976: p.
“potent with a woman defective or somehow inferior”. care staff placed their distance from patients at a minimum. 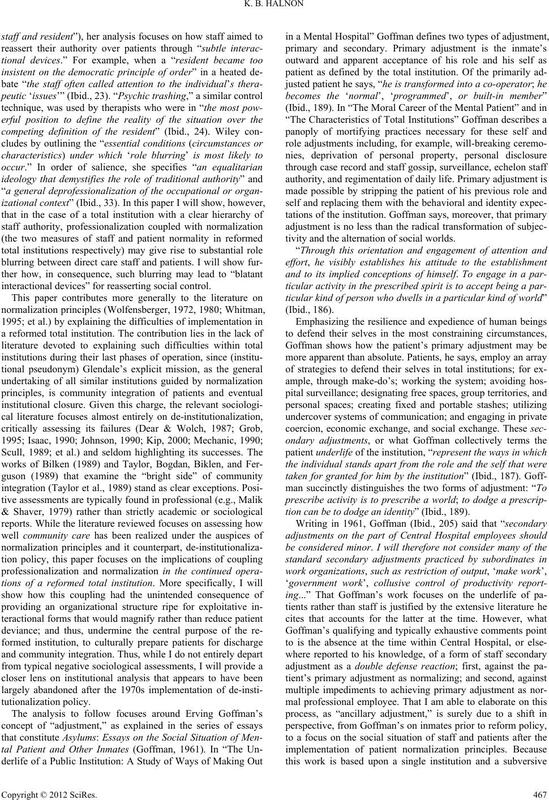 interactional devices” for reasserting social control. tivity and the alternation of social worlds. tion can be to dodge an identity” (Ibid., 189). collected at a state-of-the-art total institution. while preserving the integrity of the data. summary to maximize materials incorporated in this paper. prompter put it, “Maybe you can tell them the way it really is. tions involving a total of 15 staff prompters and 20 patients. than one performance, and in a few cases, several performances. easy for me to adopt an observer role. the behavior and to my knowledge never filed any reports. why this research did not find its final form as my dissertation. cars; or just “hanging out” with friends. discredited in a n u m b e r of significant ways. of normal employees at Glendale. was, to begin with, a highly dicey prospect. 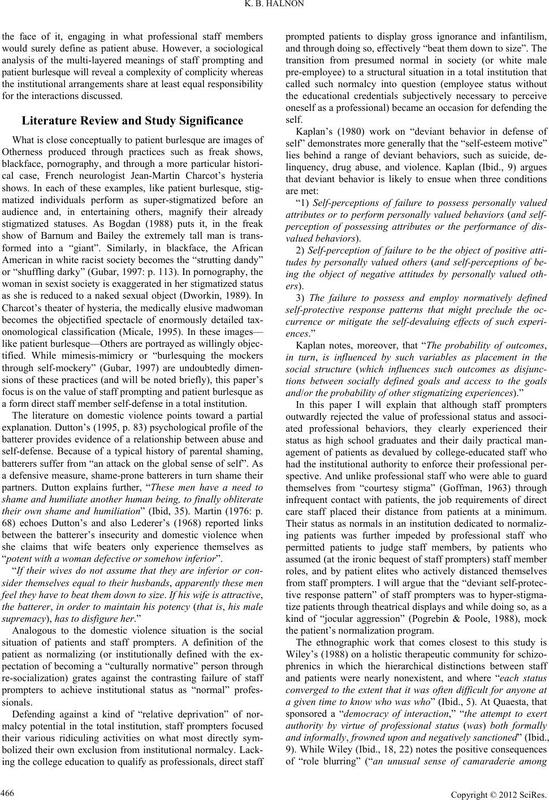 reduce patient deviance, not to expand it. secondary deviation than of primary deviation (Lemert, 1951). status or primary adjustment as professional employees. operation might be funded by the State. prompter) reprimanded him in a loud voice, ‘Shut up, already! disgruntled staff member listened quietly and nodded his head. behavior on the part o f s taff prom pt ers as their uneasy recognition of it. and patients, overtly distanced themselves from staff prompters. the same general category of seriously stigmatized others3. supervisory authority of one of the buildings to a patient heavy. rested on their legendary reputation. blurring of the lines between themselves and patients. for institutions for the Mentally Retarded in the United States. staff prompters found a dramaturgical solution. or heavily edited by them. self (“social invisibility”) for another (“objectified spectacle”). type of highly theatrical acceptance of the deviant role. the dangerously close back and front stages would stay intact. nificant emphasis on patient rights; that is, the professional staff. I often wondered, with substantial discomfort, why I was let in. even if professionals would assuredl y v iew it th at way. lesque is sexist, homophobic, and some times violent. morous testament of his “lack of brains” for doing so. between self-reference and identity (Strauss, 1972: p. 380). have been surreptitiously mocking their authority. is me;” when Sean announced excitedly, “Come on down. Lenny reverberated enigmatically, “Purple sperm. Purple sperm. was the humor of the patient’s radical cultural departure. he sang “Eight Days a Week” while taking his morning shower. magnification, of the perceived oddity of the patients involved. the person approached did not comply, “Can I have a penny? ging action and the diminutive level of begging. prompt was employed in a way similar to a “kiss up” prompt. In both case, the patient was used to playfully tease other staff. peatedly and gently tried to kiss and hug him. adjustment, termed staff prompting and patient burlesque. ity as a triple threat to the integrity of their professional selves. prompters defended their selves as normals in a total institution. 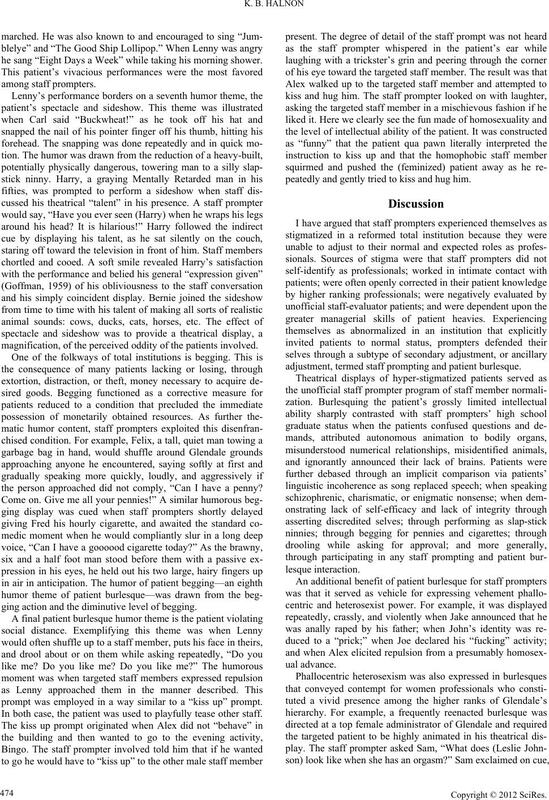 of the patient’s contrasting hyper-stigma. treatise in the sociology of kno w le dge. New York: Anchor Books. Becker, H. S. (1963). Outsiders: Studies in the sociology of deviance. amusement and profit. Chic a g o: U n i v e rsity of Chicago Pres s .
stitutionalization to homelessness. Cambridge: Polity Press. H. Robboy (Eds. 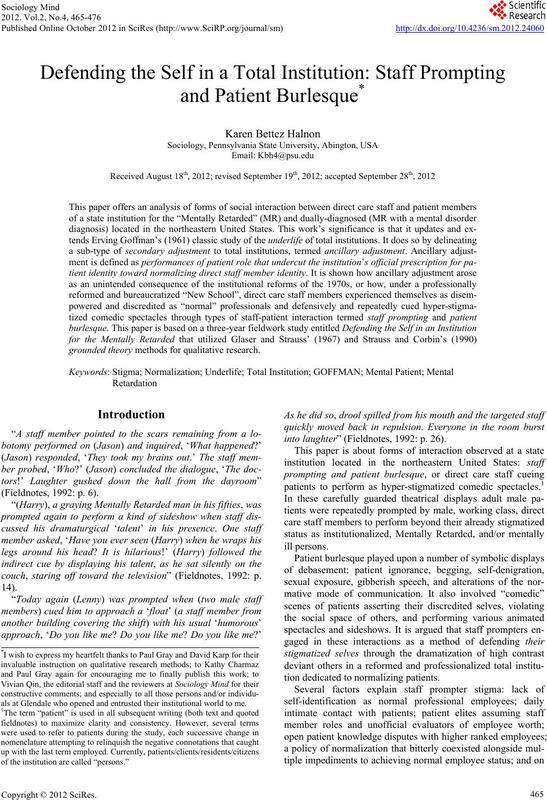 ), Social interaction: Readings in sociology (pp. 131-143). New York: Martin’s Press. Strategies for qualit ative research. Chicago: Aldine de Gruyter. tity. Englewood Cliff s : P rentice Hall. patient and other inmates. N ew Yor k: A nc h o r Books. culture. New York: Oxford University Press. abandoned the mentally ill. New York: Free Press. tionalization. New York: Basi c B oo ks . perspectives (pp. 192-195). New York: Oxford University Press. qualitative observation and a nal ys is. Belmont: Wadsworth. abled, region III, Final Report, October 1976 to September 1979. Washington DC: Rehabilitation Research and Training Center. Mechanic, D. (1990). Deinstitutionalization: An appraisal of reform. 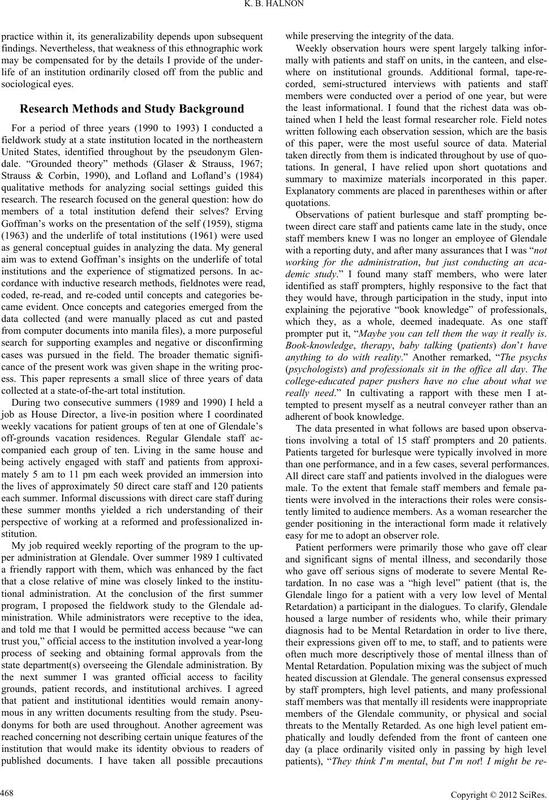 Annual Review of Sociology, 16, 301-327.
tation. Princeton: Princeton University Press. (pp. 101-125). New York: Academic Press. ed theory procedures and techniques. Newbury Park: Sage. 385). Boston: Allyn and Bacon. search & Development, 26, 467.
the mentally retarded client. Marriage & Family Review, 21, 51-64.
tion. Journal of Contemporary Ethnography, 17, 3-39.
services. Toronto: National Institute on Mental Retardation. problems, disagr eements and misunderstandings. In R. J. Flynn, & K.
E. Nitsch (Eds. 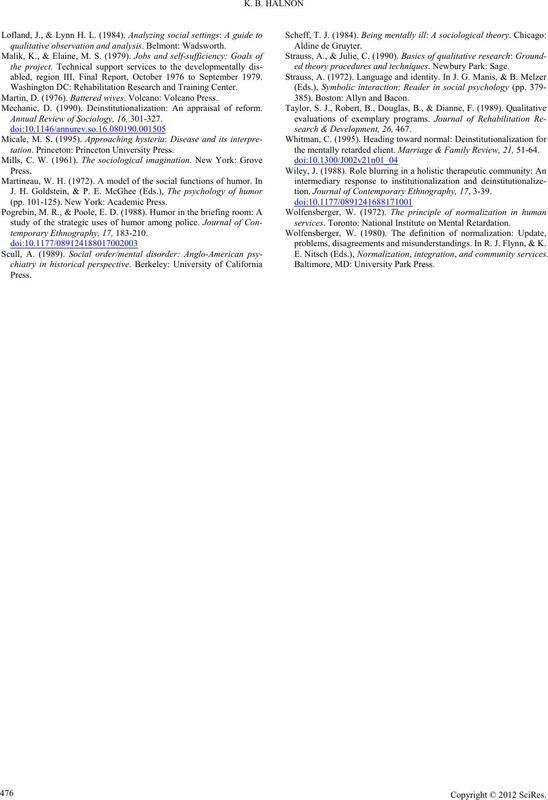 ), N o rmalization, integration, and community services.